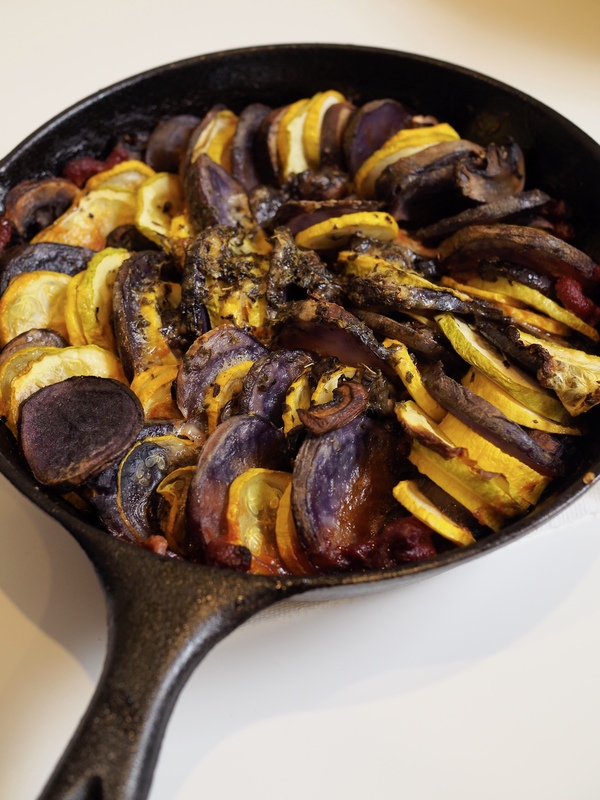 Cast Iron Summer Vegetable Tian — Oh Wonderful! This weekend marks the second weekend (in a row!) where I’ve gotten a sunburn. Thanks to my first off the shoulder top, c/o Anthropologie, my shoulders are bright red, I have a pale 4-inch gap on my arm and then everything from my elbows down is bright red. I couldn’t help but stay in the sun this weekend though, so I hit up two farmers markets to get the best fresh veggies for this summer vegetable tian. What’s a tian? I don’t even know, but I do know that you need plenty of summer squash, some tomatoes and potatoes. And an hour and a half on your hands. Most tians, however, are baked in those beautiful ceramic dishes, but I relied on my beloved cast iron instead. 1. Preheat your oven to 375 degrees. 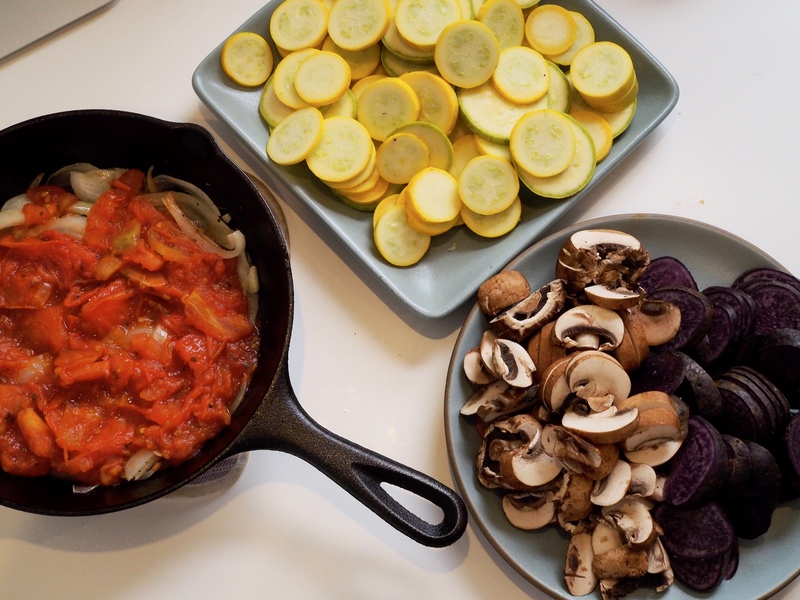 In your cast iron pan on medium heat, sauté the tomatoes, onions and garlic in olive oil with a bit of salt and pepper. Sauté for roughly 3-4 minutes, but don’t let the onions turn translucent —they’re going to cook down in the oven. 2. In a separate pan, also on medium heat, cook the tomatoes and tomatoes paste together for about 4-5 minutes. They’ll be ready once they resemble the texture of canned and crushed tomatoes. Once done, spread your tomato mixture over your onions in the cast iron pan and let them sit. 3. 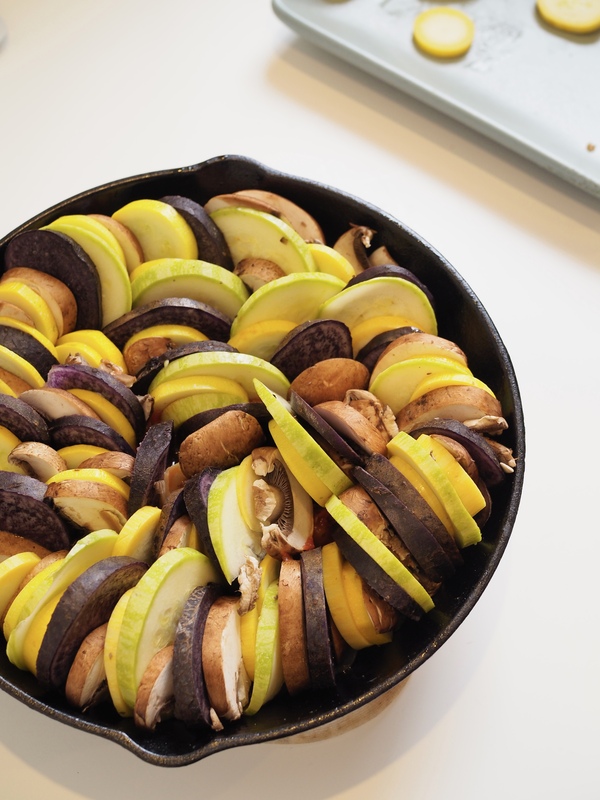 As your tomatoes and onion rest, start slicing your vegetables including your squash, mushrooms and potatoes into small circles. They should all be roughly the same thickness. 4. Layer all of the vegetables over each other so that they fan out. Start from the outside and work your way in towards the center. 5. Grate some cheese over your veggies, top with the dried oregano and cover with a heatproof lid. Bake for 30 minutes, then remove the lid and cook for 30 more minutes. Eat with pasta, rice or just on it’s own and enjoy!